The different processes in your production enterprise are increasingly interconnected – from the storage of ingredients to the packing of the finished product. To prevent each new optimalisation causing complications elsewhere in the production process, we apply an integrated strategy. Achieve optimum results with our unique approach: the Optimum PRO6® Method. This integrated approach means that when developing and implementing new techniques or improvements, our focus is on the six measurable fundamentals that define total product performance: Safety, Quality, Efficiency, Capacity, Sustainability and Maintenance. These variables are interrelated; the art lies in aligning them for optimum results. 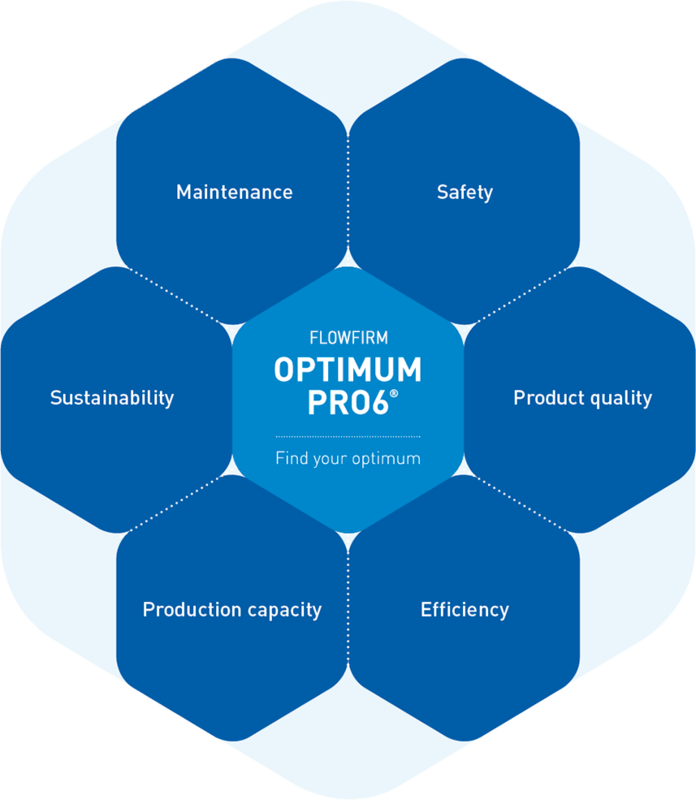 Our Optimum PRO6® Method delivers continuous updates on all aspects of your production chain – enabling you to make strategic decisions every step of the way. Let’s take a closer look at the PRO6® dimensions. Do your installations meet the latest safety standards? We’ll inspect and provide a clear evaluation. Moreover, we’ll help solve any shortcomings with a decisive plan of action, taking all six process fundamentals into account. We’ll develop an implementation plan and, if desired, put it directly into practice with your people and/or our team. The quality of your production process determines the quality of your product. So together we’ll look to improve hygiene and food safety measures wherever possible. This includes reviewing the hygienic design of your processing line and testing the quality and integrity of your product at all stages of the process. We can apply these checks to an existing processing line, as well as offer our expertise when it comes to designing and building new production lines – including the validation of the processing line at completion. By analysing the production line performance in relation to potential capacity, we’re able to determine where there’s room for improvement. For example, we can identify recurring malfunctions, or unnecessary downtime during adjustments or cleaning – anything preventing you from meeting your optimum capacity. After identifying the bottleneck, we’ll help you to address and resolve the problem, often with substantial gains in efficiency. The result? Increased production with the same technical resources. You desire the highest possible production capacity at the lowest possible costs. So we’ll go in search of process and technological improvements to increase your production volumes without negatively impacting on quality. For example, we can replace capacity-limiting components, improve conditions during production, cleaning and start/stop, or otherwise optimise your process control. Our goal: first time right production, lower costs and greater profit. Of course we all prefer sustainable production methods and socially responsible company practices. Yet many businesses dread to think of the price tag attached – unaware that sustainability often comes at no extra cost and can actually save you money! It’s all about designing lean processes with as little wastage as possible. Examples of this include production waste management, reducing water, energy and chemical use and lowering your CO2 emissions. Together we’ll look for opportunities to reuse process heat and find profitable solutions that have a positive impact on your quality and capacity. A strategic approach to maintenance is an effective way to improve your profitability. Together with you and your technical teams we’ll review the total cost of ownership and the total lifecycle benefits of your capital goods. And, if required, we’ll map out your existing systems in 3D drawings. Standardisation and limiting the number of spare parts (intelligent purchasing and inventory management) are also key to making significant gains. We’ll help cut back your maintenance costs and increase your capacity without any extra risk of breakdown. The alignment of six measurable Process Fundamentals during development and implementation is how we achieve your process optimum.